Just 48 hours after his triumph at Silverstone, Lewis Hamilton once more led the way after he set the fastest time in testing at Hockenheim, venue for next weekend's German Grand Prix. 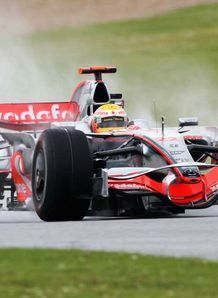 As in the British Grand Prix on Sunday, teams had wet weather to contend with and the 23-year-old McLaren Mercedes driver again made light of the conditions to set a time of one minute 15.483 seconds. World Champion Kimi Raikkonen, who shares the lead of the Drivers' Championship with Hamilton and Ferrari team-mate Felipe Massa, was second quickest, albeit over three-tenths-of-a-second slower. McLaren used the test to run a new aerodynamic dorsal fin, similar to those used by Renault, Red Bull, Toro Rosso and Force India this season, on top of the engine cover of the MP4-23 car. Williams driver Nico Rosberg, without a point in his last four races, was third fastest ahead of Force India's Adrian Sutil. Hockenheim returns to the Formula One calendar this season after a year's absence following the decision to alternate hosting of the German Grand Prix with the Nurburgring.